We manufacture a range of standard products for the window and door industry and also offer custom manufacturing capabilities to meet clients’ specific needs and requirements. 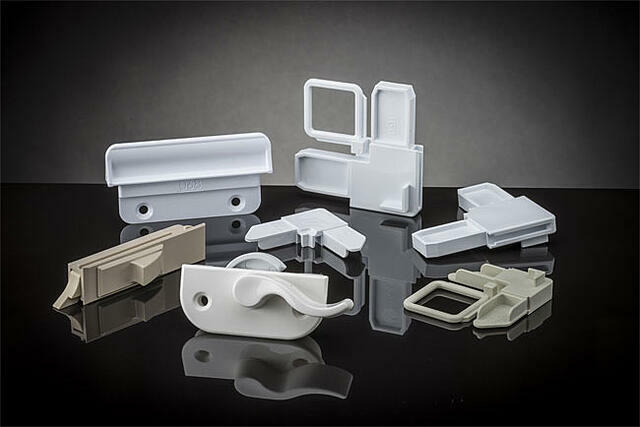 All of our window and door parts are injection molded to the highest industry standards and are available for Just-in-Time delivery to ensure our customers never experience unnecessary downtime. We use only the highest-quality materials, including engineered nylon, acetal, polypropylene, and vinyl, to ensure that all of our parts have optimal weatherability, thermal properties, and are ultraviolet (UV) inhibited. Rodon’s window and door products offer our clients numerous benefits. Our highly reliable plastic resins, for example, allow for significant cost reductions when used to replace higher-cost metal components and helps eliminate the risk of rust and corrosion when used in certain environments. The Rodon Group’s high-volume injection molding process was specifically designed to reduce costs, and our expert team helps with every step of manufacture—refining the part design, minimizing assembly time and costs, and ensuring that your specific needs are met. The Rodon Group is proud to offer a cost-effective, onshore production alternative to our clients in the window and door industry. All of our parts, standard, and custom alike, are designed to optimize manufacturability. All mold fabrication is performed in-house by our team, and our molds are designed explicitly for long-term, high-volume production, eliminating the risk of repair or maintenance charges down the line. Our stringent quality assurance standards have resulted in a customer acceptance rate of 99.8%. For more information on how Rodon has served the window and door industry in the past, check out our Residential Window Hardware Case Study or, to discuss how we can help with your window and door part needs, contact us directly.